This dynamic design is sure to take your breath away the minute you set your eyes on it! Crafted in polished 18K gold, this ring features nine full round cut diamonds in bezel settings. It also features an additional 18 full round cut diamonds in bead settings. 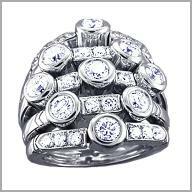 The total diamond weight is approximately 2.34ct with a color of G and clarity of SI. The setting size is 7/8" x 13/16" with a height of 1/4".